Christianity vs Critical Thinking | Duck or Rabbit? You are here: Home / Duck or Rabbit? Have you ever examined how your mind works? We are so easily fooled that we can fool ourselves on the spot, in real time, back and forth, with ease. The fact that optical illusions exist, is an objective proof that we do not see reality as it is, but often as a decision to see it the way we prefer to see it, or how we’ve been influenced to see it, or sometimes as an outright delusion. 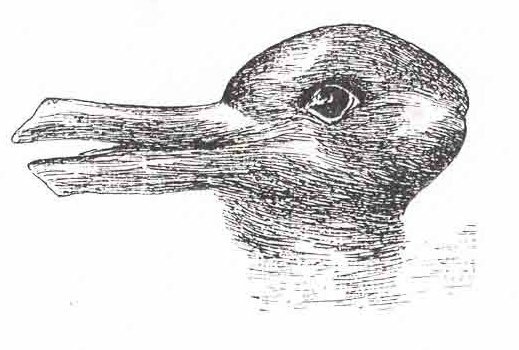 The famous philosopher and author Ludwig Wittgenstein[i], made this obvious with the “duck-rabbit” illusion[ii] that can be seen as either a duck or a rabbit. That you can see either one by switching back and forth at will, sheds light on an “internal” processing of information that exposes a truth about how we interpret the world around us. Is it a duck or a rabbit? Answer: it’s neither. It is an ambiguous drawing. And, in that small space of truthfulness between the real world (the objective world of what it actually is) and the subjective world where a symbol could be convincingly whatever you want it to be, can be found the key to unlocking the hypnotic influence of indoctrinated belief. Religion is couched in metaphor and figurative language; it’s symbolic, like the drawing. And in it can be subjectively seen whatever one wants to see! Ask ten religious people if the statement is true and they will tell you “yes” it is. But compare the statement to the real world and you’d have a sentient being that is brightly incandescent with enough glow to illuminate the entire earth while simultaneously being invisible. In other words, it cannot actually be true since they are contradictory. (Bright cannot be invisible.) In that example, every single “yes” in the religious mind, is a factual falsehood in reality. The picture, therefore, can easily represent a rabbit or a duck. But is not actually either. The real world is what actually is, and the inner (subjective) world is the world we construct as what we think is true about the external world. The inner world is a construction, influenced by an almost infinite variety of data that enter our heads. And we poor souls have to figure out what is real or what is a false construction. In order, therefore, to not be fooled, we have to constantly compare our internal constructions with the truth of the objective (the actual) world. We compare what we think is true (the hypothesis) to what we actually observe in the outer world, the testing. This process of determining truth is, in its most basic sense, The Scientific Method. Science, via the Scientific Method, is the process that is the refinement of comparing what we think is true, to what we actually observe. It is very effective. It is why science has increased our knowledge in the last 50 years, faster than in the entire history of mankind without it. Now, compare our current rate of increase of knowledge to the so-called “knowledge” from religion. The sum of what is “known” demonstrating the truth of any religion or its precepts has not increased or changed in the last 1,000 years or more. No Priest or lay, knows any more today than his predecessor knew at any time in the history of religion. What an astounding failure! Could such a confirmation be more telling about the efficacy of religious thought? The actions of today’s religious terrorists and some of today’s evangelists, are no different than what the holy books told them to do hundreds of years ago. Kill the infidel in the name of God, and hate whomever (i.e. the homosexual) the good book tells them to. But is the good book truly the word of a God? Once again, where the choice is not an actual objective truth but a subjective representation (an idea, a symbol, or a concept), you will believe whichever you chose to believe, or whichever you see. Duck or Rabbit? When it comes to religion in politics, the Duck or Rabbit illusion is apparent. Laws made in the name of, or thought guided by, a God immediately asks, “which God,” the Duck or the Rabbit? And they are all ancient, with ancient moral codes and understandings. In addition, laws authored by Man for the benefit of Man become nothing in the shadow of laws thought authored by a Duck, or a Rabbit. This is why Sharia Law (Islamic religious law code) appears so ancient and barbaric to modern secular societies. It is also why our (United States) founding fathers separated church from state (religion from politics) in the very first Amendment to our Constitution. Separation of church and state was, and remains, that important. One deals in the objective reality that affects everyone, the other deals in the self-constructed perception of wishful thinking. But the historical efficacies of religion have typically worked against the liberties of the governed; and philosophically, religion is inherently anti-democratic. Our founding fathers had hoped that by removing religion from politics the efficacies of religion “on” politics would take care of itself. This would be a two-way win for both politics and religion. It would allow for the freedom of worship without government interference as well as the freedom of self-governance unencumbered by the historical restrictions on liberty “by” religion on others. Of course, we are still waiting. But as you can see, even back then, there was the dispute over whether religion was a valid guide for men, but not governments. John Adams was in fact pro religion while Thomas Jefferson questioned its value adamantly. As you can see, they disagreed as much then as they do now. But on whether the United States was founded on Christianity, there was NO disagreement whatever. Our Republic, has a strictly secular foundation; it is described as “We the people, for the people, by the people.” And I, for one, wouldn’t want it any other way. This has been leading up to something I found quite ingenious. 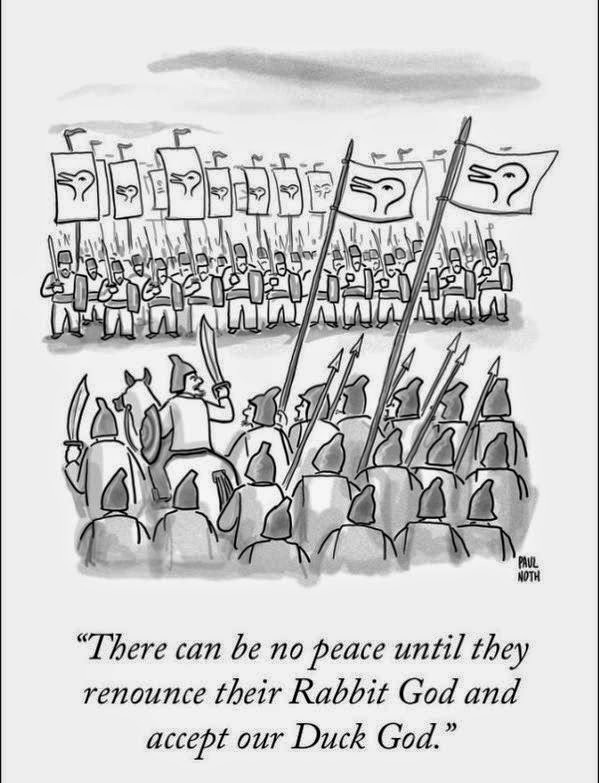 It is a cartoon that appeared in the New Yorker (which I can’t find at the New Yorker but damn near everywhere else on the Net) so I’m including a link to reddit.com where arguments persist on whether the Duck god is real vs the Rabbit god (http://i.imgur.com/GBxqls0.jpg). The reddit link connects to the actual cartoon (see the imgur link) which describes a war about to erupt on this very issue. See it here under Duck God is Best. The punchline? Notice the flag on either side!